Fig. 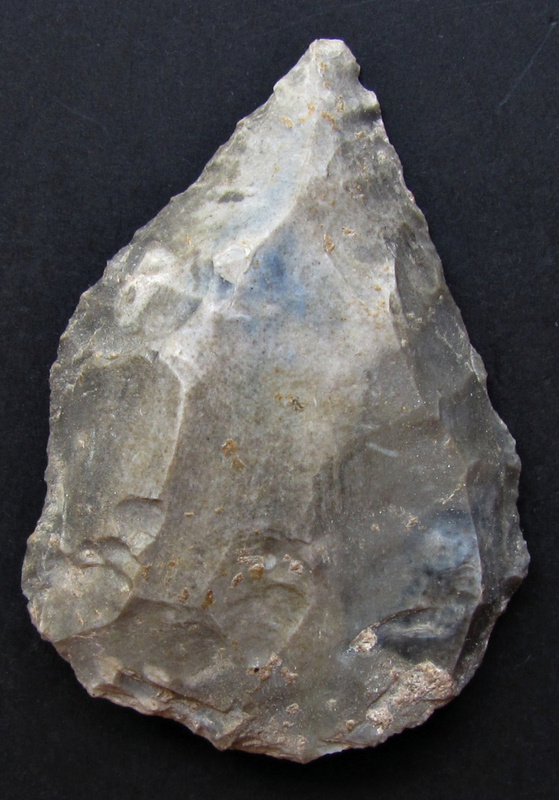 1 and 2: This is an convergent Middle Paleolithic artifact (usually called Mousterian point with Quina retouche) from an early excavation at the famous Placard cave in the Charente. Le Palacard could have served as one reference site for the region if it only had beeen properly excavated, which was definite not the case. Anyhow its stratigraphy played an important role in the famous “bataille aurignacienne” between the priest-scientists around the Abbe Breuil and the Materialistic Prehistorians, followers of G and A de Mortillet during the early 20th century. The Grotte du Placard, originally called Grotte à Rochebertier (Commune de Vilhonneur; Charente), is a large cave on the left bank of the Tardoire 13 kilometers upstream from La Rochefoucauld. Carved into a limestone cliff, the entrance to the cave is 17 meters above the river level, with a wide porch giving access to a room 25 meters long and 10 wide at the entrance. It is itself extended to the right by two narrow galleries, and to the left by a more important gallery. There are several smaller grottoes with Paleolithic material, spanning a time span from the Chatelperronian (?) to the Magdalenian, in the immediate vicinity (Grotte de Moradie [Magdalenien], de La Combe, de l` Ammonite [Chatelperronien? ; Magdalenien final] and du Sureau). 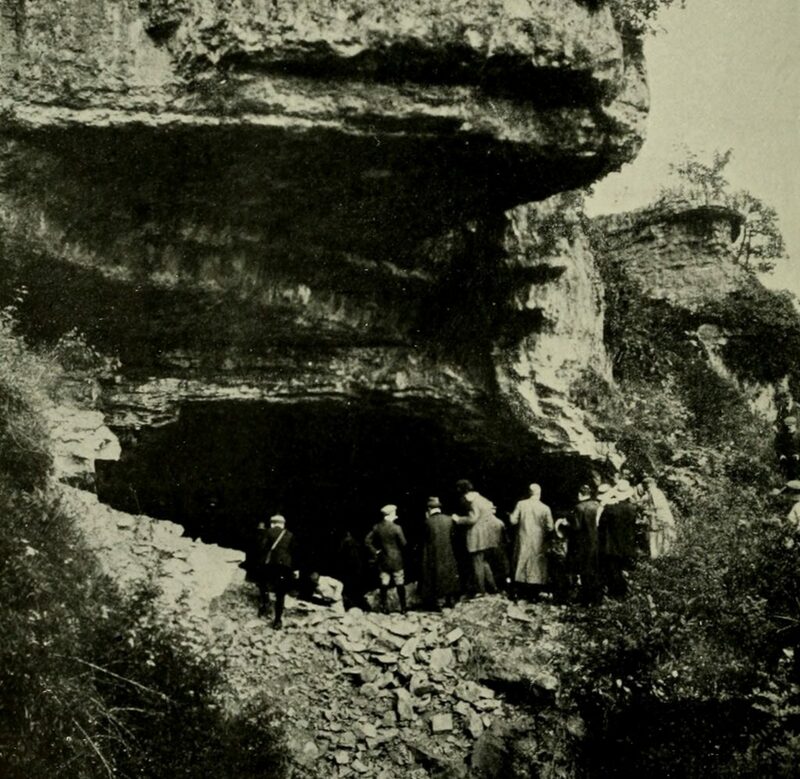 It seems that the first excavations at the Placard cave took place in 1853. The Placard site was first mentioned in the literature by J. Fermond in 1864. He was totally focused on the extraordinary rich middle and upper Solutrean levels of the site. During the later years A. de Maret, the land owner, made extensive and disastrous excavations and virtually emptied most of the cave fillings. He remains the “bete noir” of the excavators at Placard, because his technique of extracting the artifacts was below any standards of his time. He was on hunt for first-quality pieces and destructed all other artifacts to prevent others to sell pieces from Placard and to keep the prices high. It is suggested that thousand shouldered points from the Solutrean were lost during this destructive “curation”. Later more methodic excavations by Fermond, Masfrand, A. de Mortillet and by Chauvet followed. Finally the deposit, which was without doubt one of the richest in Western Europe, was not subject to any protection and suffered numerous digs that fed many museums and private collections for almost one half of a century. Therefore J. Roche in 1958 made an attempt to reconstruct the stratigraphy from what was left (mainly Middle Paleolithic) after 80 years of devastation. As a result of renewed illegal excavations, Duport resumed the excavations in 1988 and the discovery of rock art panels has led to the opening of a rescue campaign by J. Clottes and others. During his early excavations, Maret he had detected one stratum of Mousterian, two strata of Solutrean (a middle Solutrean with large leaf shaped points followed by a rich upper Solutrean with thousands of shouldered points) and four Magdalenian strata (beginning with a Badegoulien / early Magdalenian a raclettes, topped by a Middle Magdalenian and traces of a "Magdalenien final"). Based on Marets communication, the “official “and somewhat theoretical stratigraphy was published by A. de Mortillet in 1906. He described a "Robenhausien" on the top and below, three Magdalenian levels, two Solutrean levels and, at the base the Mousterian. On Mortillets stratigraphy, each level was isolated by a sterile layer formed by the debris, which fell from the cave ceiling. 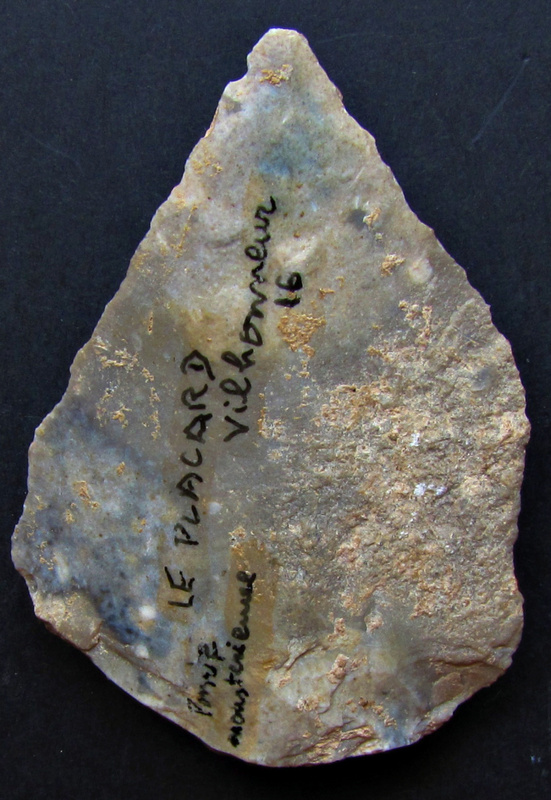 The Mousterian of Placard is testified by a rich collection of artifacts characterized by a non- Levallois production system of the blanks. Thick flakes were modified into convergent tools (convergent scrapers and “points”). There are many transversal scrapers with a typical “Quina retouche”.